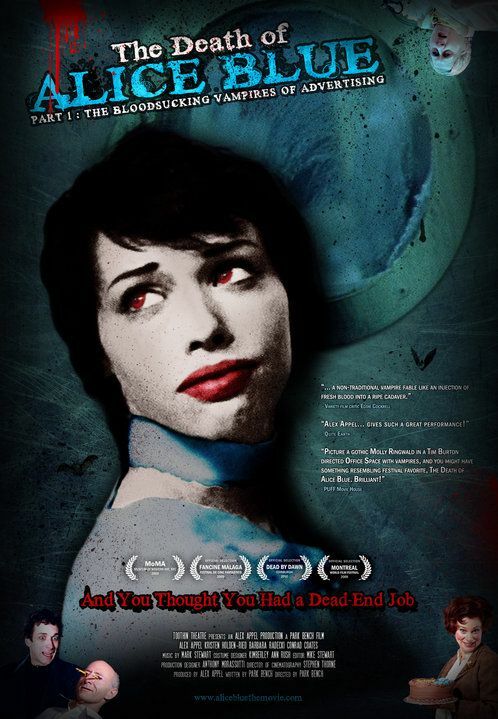 The 2009 Canadian feature "The Death Of Alice Blue" will have a special screening, Wednesday, August 31, 2011, 7 - 8:30pm @ Projection Booth, 1035 Gerrard St East, Toronto. "...shy 'Alice Blue' is the new creative intern at 'Raven Advertising'. Unfortunately for her the place is run by vampires. A group of eccentrics enlist her aid in thwarting their nefarious schemes but there's a complication. "There's the possibility that she herself may be genetically predisposed to being the greatest vampire ever. As the only one who can save the dying breed, Alice is forced to confront herself and make a stand, whatever the outcome..."